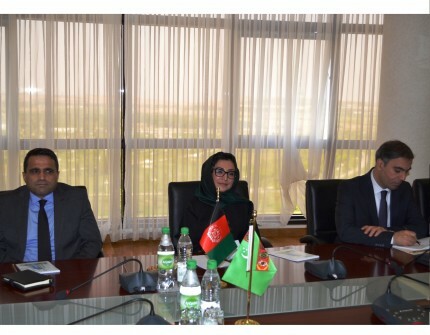 On October 12, 2017, the Ministry of Foreign Affairs of Turkmenistan held a meeting with the delegation of the Islamic Republic of Afghanistan headed by Deputy Foreign Minister Adela Raz who arrived in the Turkmen capital on a working visit to participate in the Academic Forum held within the framework of the VII Ministerial Conference on regional economic cooperation on Afghanistan. At the beginning of the meeting, the sides noted the active pace of development of cooperation in a wide range of areas, the basis of which are close ties between the Presidents of Turkmenistan and the Islamic Republic of Afghanistan. Noting the existing potential for expanding trade and economic relations, the parties expressed their full commitment to consolidating efforts to further expand them. In this context, the role of the Intergovernmental Turkmen-Afghan Commission on Trade and Economic Cooperation was noted. Continuing this theme, the Turkmen side noted that regional economic integration is one of the priorities of foreign policy and Turkmenistan fully supports and participates in projects of an economic nature in the field of energy and transport. Noting that regional economic cooperation is a key element for achieving sustainable development and lasting stability in the region, the parties considered issues related to the preparation and holding of the RECCA VII, which will be held on November 14-15 this year in Ashgabat. As part of the discussions, the parties put forward a number of proposals on the possibility of holding side events of an economic nature.